Today my guest is Jeremiah Donaldson, a writer and music lover. 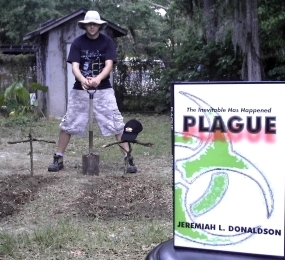 All of you readers have Jeremiah to thank for being able to read me in print. He was the one who inspired me to try out Create Space and publish my first novel, Night’s Knights. After getting my feet wet with that, the anthology offers from publishers started rolling in. So thank you Jeremiah! Art in all forms can be inspiring. From paintings, to sculpture, to architecture, to writing of all types. However, many of those artists have another art in common: music. I’ll only mention that music possibly started off as a practical tool for communication with origins in prehistory, it’s a powerful mood altering tool, and that it can be broken down into mathematical/geometrical equations and studied, with discoveries reaching across both fields. This isn’t a science lesson. Even if so, the body of musical analysis could only be touched on here since it’s spread across many fields of study. Why do movies have background music? Because it sets the tone. A story is nothing more than a movie in words, and the content at time of creation is highly dependent upon outside factors that get filtered through the writer. Much the same way a movie uses music to set a tone, I use music to normalize the tone of my writing by having something consistent to filter while working. However, loud music can be distracting, and I find it best for myself to set the volume so that I can only hear it clearly once I stop typing. But all music isn’t created equal for this purpose. My musical tastes are eclectic, ranging across many decades and most genres. I have many songs I could pull up for any given tone or mood, but there are genres I prefer for specific work because of the energy and themes behind them. Rap rock: This is my favorite general category, but the music within it ranges greatly, such as: Rehab, Hed Pe, Tech Nine, Linkin Park, Hollywood Undead, and many more. The overall themes are upbeat, sometimes tongue in cheek, and cover a wide range of subjects. The energy level varies from medium to very high, and I can listen to it while writing and doing about anything. Metal/punk: I’ve got to the point that I’m not sure if I could write an action scene without these two music genres and bands such as Slipknot, Mushroom Head, Rise Against, System of a Down, Clutch, and Offspring. The high to very high energy and defiance themes are nice for a fight scene or just when generally not motivated. This is also what I prefer to listen to when doing any type of housework, yard work, mechanical repairs, or other physical labor. Soft: I call anything with a low to medium energy level ‘soft’. In comparison to the other types above, that is, and pays no heed to genre or decade. This covers the widest range of genres and includes such as Waylon Jennings, Louis Armstrong, Tom Petty, Kid Cudi, Atmosphere, The Sweatshop Union, Nappy Roots, and The Who. This is generally the type of stuff I listen to while editing. The lower energy level still provides background noise, but doesn’t pervade the writing so much, allowing more focus on the actual words than the energy behind them. On a seemingly unrelated subject, the TV show Dilbert is another of my favorite background noises for editing. However, it’s the intro music that sets the weird tone for it overall. Humor: One of the many ongoing projects I have is The Stoned Poet FB page. This grew from some poem/songs I wrote 15-16 years ago that’d also resulted in the creation of the word ‘ephiroll’ that has turned into a lot more since. The music that fuels the oddball limericks and memes on the page, all of which are based on personal experiences, observations, and conversations, are the likes of The Bloodhound Gang, Stephen Lynch, Adam Sandler, and a few other such artists. Music is a powerful thing to have in your personal toolbox. Depending on what you need, it can be inspiration, motivation, or therapy from a stressful day. I can’t imagine the depressing darkness that would exist without the soothing, energizing power of music. All types of music gets blamed for people going nuts, but where’s the stories about people going nuts without it? Jeremiah Donaldson is a SF/horror writer, editor, and game designer working from London, Ky. Visit him at his home on the web at: www.ephiroll.com. Thank you Jeremiah for sharing your thoughts! So what music inspires you to write? Share yours in the comments below and tune in here next time when one of my friends shares their music inspirations.